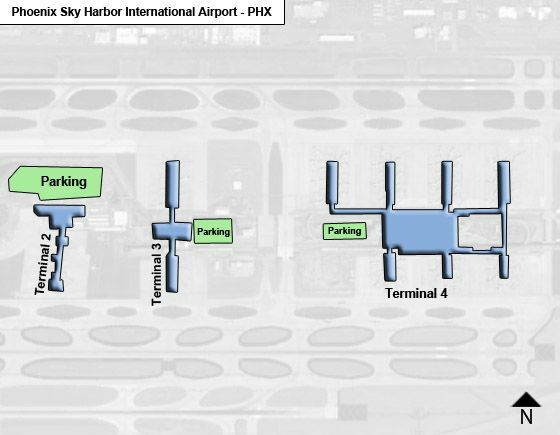 The passenger terminal complex at Sky Harbor Airport presently consists of three operational terminals - T2, T3 & T4 - T4 being the dominant one. Sky Harbor Road divides the three terminals with the corresponding parking terminals on the opposite side. This complex is located between 24th Street to the west and 44th Street to the east. In front of each terminal at the baggage claim level are taxi & limo stands, and stops for inter-city shuttle, charters & Blue Diamond buses. - Passenger pick-up & drop-off areas for T2 is at north curb; for T3 north & south curb; for T4 drop-off is at north & south curbs on level 2, and pick-up on level 1. A walkway at T2, between doors 7 & 8 leads to T3. Alternatively, use the services at the 44th St. Sky Train Station & take the Sky train to T4. - Passenger Paging - Inside the terminals - look at PAL automats with phone. From outside call 602-273-3455 or send e-mail (open: http://skyharbor.com/Email_PassengerPaging.aspx). Pages are being announced verbally and visually throughout the terminals. - The PHX Sky Train now connects all three terminals. It runs from the regional 'Valley METRO' light rail station at 44th Street / to the Airport's east economy parking lot, and moves on to T4, & to T3 where a new walkway connects to T2. Trains arrive/ depart every 3-5 minutes. The PHX Sky Train stations offer kiosks to print boarding passes and feature a pet relief area. Both the 44th Street Station & East Economy parking also offer early baggage check-in for American, Southwest , United or US Airways passengers, have cell-phone waiting lots for passenger pickup, and sell METRO light rail tickets. - International Arrivals: Most international flights arrive at Terminal 4 (gates B23-B28). Unless you have gone through US customs clearance by participating airports, you need to go through passport check, retrieve checked bags, go through customs clearance and - if transferring to another flight - re-check-in bag. Allow for at least 35-45 minutes for customs & re-check-in procedure, and another 30 minutes to board the shuttle, go through security and to your connecting gate. International Arrivals at T4 have access to currency exchange and ATM banking on level 3. NOTE: Automated Passport Control Kiosks (APCs) may be used by all passengers, including U.S. citizens. NOTE: As of June 2017 a new CT checkpoint scanning equipment in 3-D image - in the testing stage at T4 - can be viewed and rotates for more precise analysis. If testing result is positive, the device will be installed in all teminals and would allow passenges to keep their liquids, gels, aerosols & laptops in their carry-on bags - expediting the security process. - TSA PreCheck is available for quicker security check lines - enroll online at tsa.gov or at the Enrollment Center is at T4, level 1, west end, near Door 2. - Global Entry (globalentry.gov) speeds up the Customs procedure. - Self-service check-in: To avoid long lines at the Airport check-in counters, the best option is to check-in online by visiting your airline's website. There are also self-service check-in kiosks in the Departure areas of the terminals. If using American, Southwest or United airlines you may also take advantage of their Early Bag Check at East Economy Parking (drop off bags before parking; signs will guide you), at the 44th Street PHX Sky Train Station (on level 2 on station's east side), and at the Rental Car Center (after car return & before boarding the airport shuttle). An information counter is on level 4. Also, 'Navigators' are happy to be of service to passengers- recognized by their purple jacket or shirt. Food & drink is available past security check, near gates. Terminal 2 of Sky Harbor Airport with airline gates 1-15 currently serves Alaska, Boutique Air & Great Lakes, Spirit, Sun Country & United airlines. Outside of the lower level ticket counters are transport stops for the City Bus & Dial-a-Ride and rental car shuttles. Opposite of the ticket counters is the baggage claim (near door 7), with outside walkway to T3 & Sky Train, and pet relieve area. The Main Lobby houses Information counter, Press Express, a cafe & Travelmart. After security check, you have access to gates C & D (at left) - or take the elevator up to to gates 1-15 (at right) - or take elevator/stairs to the Military Hospitality Room - USO Arizona on Level 2, as well as to security check points and gates: The gate area houses The United Red Carpet Club and a play area, as well as food & drink & retail concessons. Terminal 3 of Sky Harbor Airport with gates 15-26 currently serves Delta, Frontier, Hawaiian & JetBlue (Delta ticket counters are now behind them). Food & drink, as well as retail concessions are available throughout the terminal, and Kids Play areas are in the North Concourse. NOTE: The first phase of T3's upgrades was completed in early Dec. 2016 - exhibiting great views, natural lighting, consolidated security checkpoint (with ample space thereafter for passengers' 'recomposure') and 31 new common-use ticket counters. Level 1 of T3 houses 31 new common-use ticket counters and baggage claim. PHX Market serves coffee & grab-and-go items. (Note: After leaving the airline ticket counter, take escalator up to security checkpoint on level 2; thereafter take the excalators to level 4 to access your gate). Level 2 of T3 houses the new consolidated Security checkpoint . After going through security, proceed to level 4. Level 4 of T3 is the boarding area with gates 15-26. There is a nursing station, ATM, indoor pet relief area, shoeshine, a few shops, starbucks and restaurants, Farmers Market and charging station. NOTE: The next addition to T3 will be family restroms and nursing stations. Future upgrades include replacing South Concourse & adding new food & retail concessions - and upgrading North Concourse's amenities. Terminal 4 of Sky Harbor Airport, with airline gates A1-A30 and B1-B28, is the dominant, award-winning terminal, accounting for 80 persent of all Sky Harbor passengers, and currently serves Air Canada, American, British Airways, Condor, Southwest, Volaris & WestJet airlines. - Air Canada, American, British Airways, Volaris & WestJet at - gates B15-B28, international gates B23-28 . NOTE: Under Phase 1 of its upgrade work, PHX opened early 2017 new stores with a mix of diverse products and services. 16 more retail shops are presently being added - inlcuding a TripAdvisor store (a first in the U.S.), a store with Lucky brand merchandise, two duty-free stores with duty-paid option, Brookstone, as well as a drug store with a medical clinic and doctor on staff. The stores open in phases up to first quarter 2018. - at East side: Vans, rental car center shuttles, limos, courtesy & pre-arranged shuttles; inter-city transport, and Airport Shuttle to T2, T3 & West Economy Parking. - at North side: vans, courtesy & pre-arranged shuttles, taxis, inter-city transport & charters. International Arrivals: After baggage retrieval & Customs clearance, you find currency exchange, paging phones, information counter, coffee shop, and access to East Parking levels 4-9. Level 2 of T4 is the Ticketing Level wich check-in facilities. The North side has odd doors numbers 21 - 27, the South side has even door numbers 22 - 28 - with Dial-a-Ride near door 22; Paging assistance is near South doors 22 & 28. NOTE: Level 3 also houses the entrance to the PHX Sky Train, connecting to East Economy Lot and Light Rail System (see 'Getting Around' above). Arriving passengers from 44th Street/ Washington station may walk directly to security checkpoint. - United Club at T2, past gate 7. - American Admirals Club at T4, at gates A7 & A9 (tel. 480-693-4072); between gates A19-21 (tel. 480-693-3366); & above gates B5 & B7 (tel. 480-693-2994). - British Airways Lounge: Terminal 4, between gates B21 & B23 (tel. 480-693-2994). - The Club at PHX is a pay-in Airport lounge located between gates B21 & B23.